Generally occur between 11 and 17 yrs old. Often associated with athletic participation: direct blow during contact sport or fall onto outstretched arm. Also associated with aneurysmal and unicameral bone cysts and radiation therapy for malignant tumors. 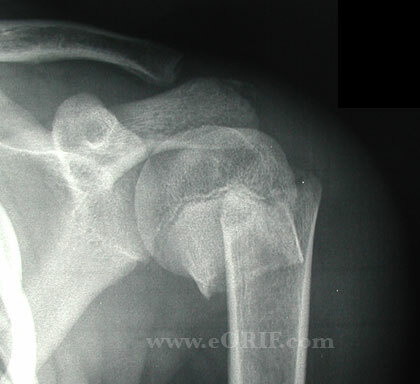 Proximal humeral physis accounts for 80% of the longitudinal growth of the humerus. Proximal humeral epiphysis does not begin to ossify until @ 6months old. 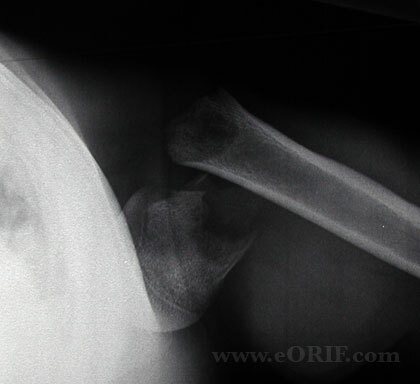 Secondary ossification center for humeral head appears by 4 to 6 months of age. Tuberosities fuse at 5 to 6 years old. Proximal humeral physis between humeral head and the shaft fuses at age 16 to 19 years. Shoulder pain and swelling generally after fall onto oustretched arm/shoulder. AP, scapular lateral and axillary views. Fracture generally easily identified in patients >6months old. Must rule out associated dislocation with axillary view. MRI, ultrasound or arthrogram may be needed in patietns younger than 6 months old. Salter Harris Type I: most common in pts <5y/o. Salter Harris Type II: most common in pts >11y/o. Metaphyseal fracture: most common in pts 5-11y/o. ->12y/o: 40° angulation, 50% displacement. Surgery: closed reduction, percutaneous pin fixation. Closed reduction may be prevented by interposed biceps tendon or periosteal flap. Review of 30 pts age 8-15 with proximal humeral epiphyseal fractures ranging 5-100% displaced and treated with no reduction to open reduction. Despite a maximum of 2cm of shortening all pts had full ROM and no functional complaint with insignificant angular deformity. 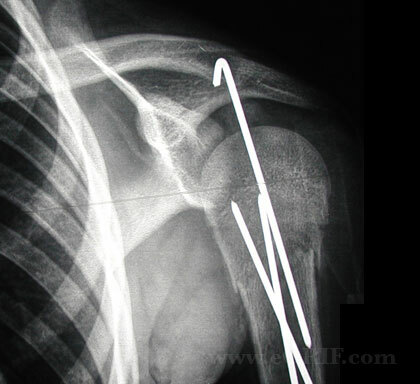 This great remodeling is due to the fact that 80% of humeral growth comes from the proximal growth plate. This author recommends open treatment for open or tented skin and neurovascular compromise only and closed treatment is unneeded. Baxter MP, Wiley JJ: Fractures of the proximal humeral epiphysis: Their influence on humeral growth. J Bone Joint Surg 1986;68B:570-573. Neer CS II, Horwitz BS: Fractures of the proximal humeral epiphyseal plate. Clin Orthop 1965;41:24-31.